On the last day of May last year, a jet-lagged Johnny Sexton sat himself down in a room overlooking the North Harbour Stadium in Albany with the weight of the world on his shoulders. He looked weary, worried and uncharacteristically downbeat. He had Owen Farrell on his mind. Four years previously, Sexton was the first-choice No 10 in Australia - with Farrell the young apprentice. In 2017, the dynamic was different and the way the Irish out-half saw it at the outset of the tour he had ground to make up after a disappointing PRO12 semi-final performance. "He's a world-class player," he said. "He's had some great success over the last couple of years, and obviously I know what that feels like having had the same success with Leinster, but probably four years previously. He's obviously coming in as favourite to start somewhere, so it will be up to me to try and prove that I can still play that role." Ten months on, Sexton's mini-crisis of confidence is at odds with the man who has bestrode the Six Nations over the last seven weeks and stands on the cusp of greatness. In the weeks that followed in New Zealand, the world watched as the Dubliner rediscovered his mojo and forced his way into the Lions Test team through the force of his own compelling form. He has not looked back. There is a growing sense that no one is irreplaceable in this Ireland system, that the show goes on regardless. Lose Tadhg Furlong and Andrew Porter belies his inexperience with a dominant display, do without Seán O'Brien and Josh van der Flier will deputise. He gets injured and Dan Leavy steps up. Even when Conor Murray went down against Wales last season, Kieran Marmion stepped in and stepped up to kick off Ireland's 11-game winning streak against England a year ago. Sexton is the exception to the rule. He is the same age now as Ronan O'Gara was in 2009. A two-time Test series Lions out-half with three Six Nations titles and three European Cups under his belt. His place in the pantheon is secure, his contribution to Irish rugby cannot be diminished by what happens on Saturday. It can be taken on to a whole new level. When Sexton eventually concedes defeat to his body and gives up the game he loves, he deserves a place alongside the heroes of 2009. He is the heart, soul and conscience of this team. He is not the captain, but he sets the tone behind the scenes, keeping those around him honest and leading by example. "He's a competitor," Schmidt said of his playmaker. "The other players love that about him, because it gives him licence to lead. When you put your own hand up, it's pretty easy to lead others and he does a super job of it." Although his recent conversion to social media has shown a lighter side to the fearless out-half, he has maintained a low public profile during this tournament - granting one quick pitch-side interview toTV3 after landing the match-winning drop-goal in Paris and appearing last Saturday night after guiding the team to their third Championship in five years. If anyone is comfortable letting their rugby doing the talking, it's Sexton who is surely the leading contender for player of this year's Six Nations after being the competition's dominant force. He has already provided the tournament with its defining memory, his ice-cool drop-goal at the death at the Stade de France will stand as a great Irish sporting moment. Since 'Le drop', he has had a string of memorable interventions - the pass to Jacob Stockdale, forceful tackle on Ross Moriarty, his chip and chase against Scotland to name but a few. He has been driving his team relentlessly towards the title. As the tournament has gone on, he has been managing a glute injury that has hampered his kicking and limited his training yet his performances have barely dipped. Sexton's career with Ireland has been distinguished by great days, but the Grand Slam and the World Cup are the pinnacle. Since 2009, the opportunity to win all five Six Nations games has evaded the team. At the 2015 World Cup, he got injured on the eve of the quarter-final. Had he played against Argentina, his force of will may have broken the quarter-final glass ceiling. 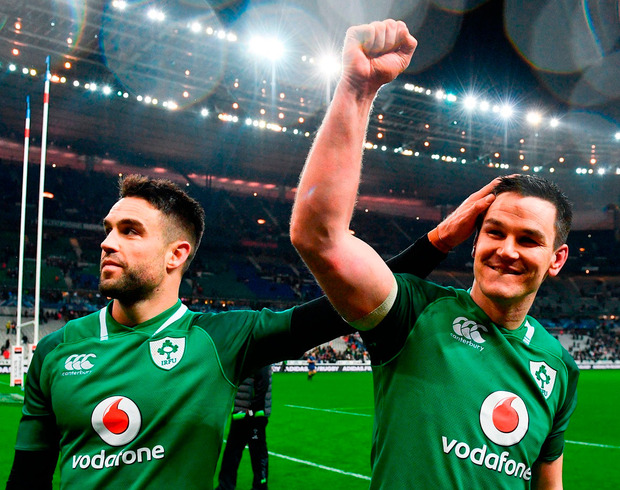 Nine seasons on from the dramatic afternoon at the Millennium Stadium when Brian O'Driscoll, Paul O'Connell and O'Gara seized their moment, Sexton is the key driver of a very different Irish team. He has been for some time. When fit, he is the first name on Schmidt's team-sheet. He has been described as his master's voice on the pitch, but Richie Murphy - who has worked with both men for most of his coaching career - there are clear differences between them. "Father and son," the skills and kicking coach said with a wry smile when asked about the duo who will go down as one of Irish rugby's great double acts. "I actually think they're quite different; just different people, both very passionate about the game. "They're extremely intelligent guys and very savvy in relation to their rugby brains. They work together to find situations they can exploit. But I wouldn't say they're very alike. "Johnny is in a really good place, he has obviously had a lot of change in his life over the last while with a couple of kids coming along so you know you can see a different side to him. "He is obviously a fair bit more mature than he was maybe at the start, he has got other worries which is probably a good thing for him because it will distract him from the game. But I think he is in a really good place, he is really hungry." The dust has long settled on O'Gara and Sexton's playing rivalry and now the Crusaders coach and television analyst can appreciate his one time foe who he described as "the King" after his Paris match-winner. Murphy believes comparisons between the duo are facile given the way the sport has moved on in the last couple of years. "The game has moved on quite a lot in that period of time with how defences are organised," he said. "Johnny would definitely have been more of a running threat, ROG was obviously very tactical, very astute with where the game was played and finding corners... Johnny has the ability to do that but he's also interested in playing the defence that is front of him, create mismatches and find opportunities for guys to attack people." He was a fly on the wall almost a decade ago as he watched O'Connell, O'Gara and O'Driscoll steer the team towards the port. Now, he is the senior voice alongside Rory Best and Conor Murray as the moment of truth arrives. The title is a reward for an impressive tournament, but the Grand Slam would mark this season out as special and confer greatness on the men who deliver it. Two years ago in Twickenham, Sexton tried to win on his own in a team low on confidence and experience. If he produces something similar on Saturday, he'll have a lot more support with him. Again, Farrell is in his sights but this time there will be no doubt in his mind. This time he can cement his legacy.